5th sentence, 74th page: The water no longer felt cold; it was warming against his skin, running down his face and into his eyes. Birds and orphans intertwine to create a horrifying tale of revenge. This story gave me the heeby jeebies. 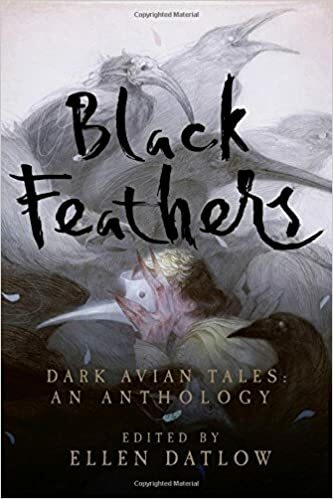 Which most of the stories in the Black Feathers collection do. The watching of birds and flashbacks to a past of bullying and abuse gave this story a very disjointed feel. But it isn’t until the end that I start to feel truly uncomfortable. After all, that is kind of horrifying. And it did leave me with some very not-okay dreams. I think one of the reasons that I find this story so horrifying is that I like the idea of adopting in my future. And this child, the orphan bird, is a terrifying idea. He thinks nothing at murder, and even finds himself a young child to train in his place. There is such a sense of horror at the calm and assured way in which he follows the birds and commits his acts. Just. Terrifying.